This past August, Mr. Pirate & I went on a 2 week road trip through Idaho, Wyoming, Utah & Nevada. Not wanting to be caught short on handwork to work on during our daily car ride, I prepared several projects, of which this was one. The pattern is "Looking Glass View" from PatchWorks Studio and is part of their Too Easy Stained Glass collection of patterns. (parenthetical comment: they've added some phenomenal new stained glass patterns; go take a look!) I've used their patterns before, with other projects, albeit done by machine. I've even used them to teach a class at one of our Arizona Retreats. They are wonderfully easy and look exceedingly complicated. What I discovered was that doing needleturn applique for a stained glass window design in BLACK fabric whilst riding in a car isn't the easiest thing to do. [end understatement mode] So, I put it away for the duration of the road trip to work on other projects. BUT, I did want to finish at least the needleturn portion, so I continued to work on it, more or less sporadically, upon our return home. I am now pleased to say that the needleturn is done! 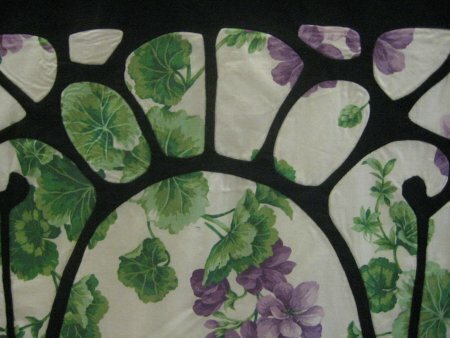 I centered the stained glass design (pictured above) in a width-of-fabric strip of brushed black broadcloth, so that there would be options available to use for finishing. I don't think the extreme amount of black fabric on the top/bottom will remain there. The next phase is for Lisa to decide what is to be done next. The current thought is have a couple of narrow lavendar/purple accent strips and then a fussy-cut hydrangea appliqued in a corner. And that is why this project is a Pseudo Forever Proejct ... I didn't really expect the needleturn to be done so quickly and now I am in a waiting cycle until Lisa makes her final decision. Oh, if you're interested, the other stained glass projects from PatchWork Studios that I've done can be seen on "Get the Lead Out!" page. That project page also contains links to pictures of more easy stained glass projects.